In our Vision 2030 framework, we’ve outlined 7 key principles that will push education to adapt to our modern world. 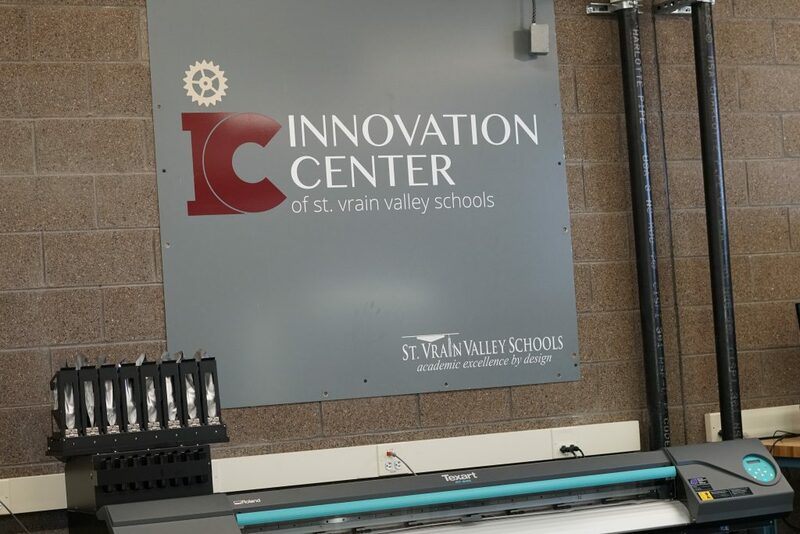 At the St. Vrain Valley School District Innovation Center, these principles and the student experiences that build core student competencies are on display as model of how to captivate students. 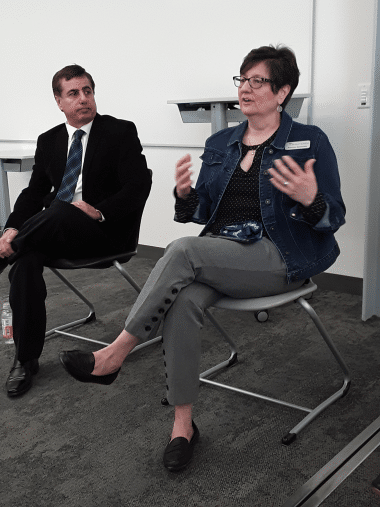 St. Vrain is often thought of as a state and national leader, so we invited Colorado Succeeds members to see what it means to innovate in our current education system. When you explain that the SVVSD Innovation Center is a 50,000 square foot building that can accommodate over 700 students earning certifications in aeronautics, biotech, robotics, and more – it sounds like a stroke of magic that landed in the northern part of the Denver Metro region. But it starts with the right mindset. As we heard from St. Vrain Valley School District Superintendent, Don Haddad, Ed.D. the need to innovate was driven by a rough starting place: the district was 15 million dollars in debt in 2001. Supt. Don Haddad, Ed.D and Assistant Supt. of Innovation Patty Quinones share with the group. A large part of doing business in 2019 includes partnering with companies, nonprofits, and higher learning institutions. The Denver Zoo and the National Center for Atmospheric Research (NCAR) are just a couple of examples. As students design and engineer technology solutions in real-time, you also have to have educators who are dedicated to learning. 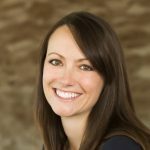 “What’s unique about the innovation center staff is that they kind of have that entrepreneurial mindset. And they also are really very aware of Don’s vision and what we’re trying to do,” said Patty Quinones, Assistant Superintendent for Innovation in SVVSD. Engaging students in a world full of distractions and teaching them how to learn – instead of what to learn – is not an easy task, but education must evolve to better prepare students for the future of work. 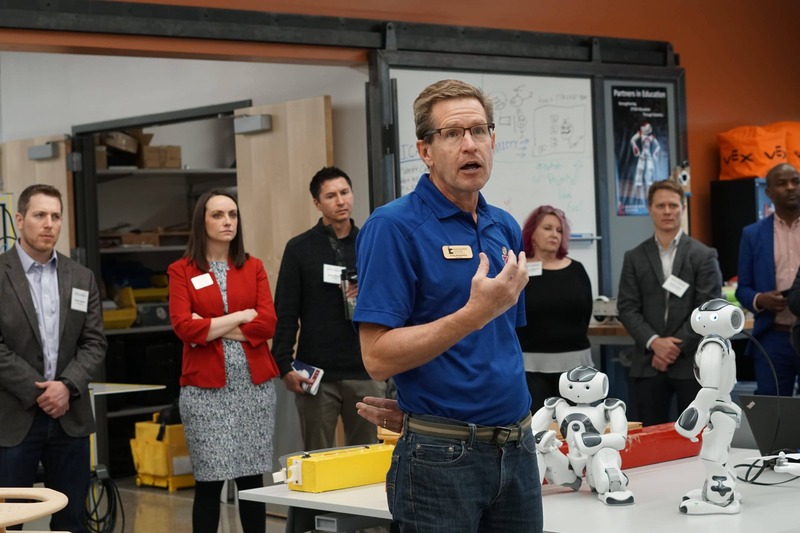 The SVVSD Innovation Center is just one example of how to bring the world of work into the classroom and develop the homegrown talent Colorado needs. As we continue to highlight what works in the movement to transform education, one thing is clear – collaboration is key.